Name Her Yourself! Newborn Baby Girl Doll is a Collectible Masterpiece of Realism by Doll Artist Denise Farmer! 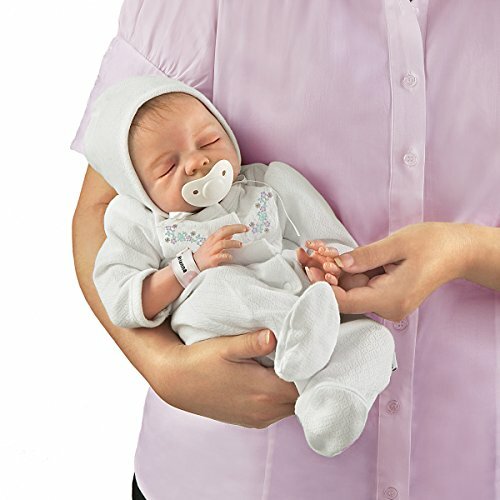 - Experience an astounding level of realism with this collectible So Truly Real(R) newborn baby girl doll! 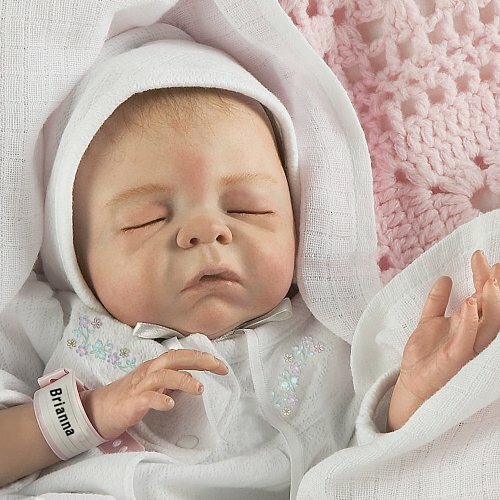 Echoing the heavenly beauty of a real live newborn, this breathtaking collectible lifelike baby doll is a marvel, from her exquisite face to her delicate wisps of hair, her supple fingers, and even her tiny, wrinkled feet. Still slightly flushed from the miracle of birth, she snuggles happily in your arms and waits for you to give her a name. Then all you have to do is - cherish her!Exclusively from The Ashton-Drake Galleries by renowned Master Doll Artist Denise Farmer, Cherish is a remarkable edition to the world-famous So Truly Real(R) vinyl baby dolls. Hand-applied hair, wispy eyelashes and tiny hand-painted fingernails and toenails complete the illusion of life. Cherish arrives in a footed sleeper with a matching cap, and even comes with a FREE pacifier and a hospital bracelet you can personalize when you choose her name! Don't wait, intense demand is expected - order now! An astounding collectible lifelike baby doll by renowned Master Doll Artist Denise Farmer and available only from The Ashton-Drake Galleries Cherish is a masterpiece from the So Truly Real line of collectible vinyl baby dolls, renowned for their remarkably lifelike qualities Exquisite features, wispy hand-applied hair and eyelashes, and long supple fingers and tiny wrinkled feet with hand-painted nails complete the illusion of life Cherish comes with a FREE pacifier and a hospital bracelet you can personalize when you choose her name! This doll is not a toy, she is a fine collectible to be enjoyed by adult collectors.